The tipping point between prolonged disappointment and renewed vitality is a difficult conversation. Many leadership frustrations are the result of conversations that didn’t happen. 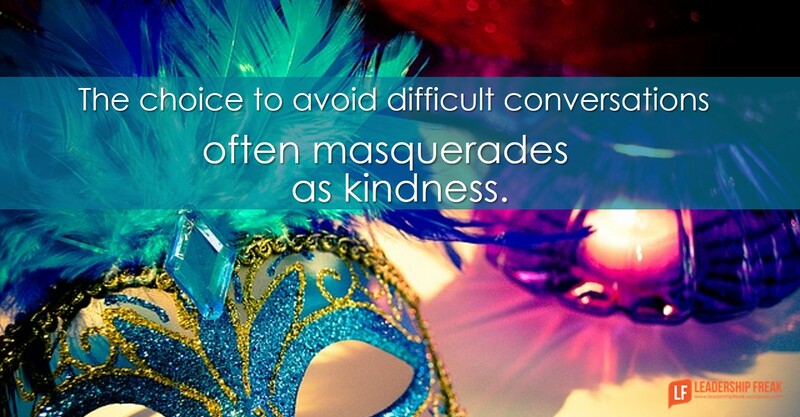 The choice to avoid difficult conversations often masquerades as kindness. Any dullard can sling muck. How deeply committed are you to the best interests of your team members? How trusting are your relationships? Apart from trust, positional authority, threat, and pressure are all you have. An open heart hinges on trust. How forward facing are you as a leader? Dabble in the past. Dance in the future. Adapt in the present. How much do you believe in them? Any response less than 7 indicates you have work to do before the conversation. Make a list of their top five contributions. Make a list of their top three strengths. Anticipate friction in the form of resistance, distraction, excuses, blaming, or self-condemnation. Resistance is the pivotal moment in transformative conversations. Wait for the moment of opportunity that begins with, “I don’t know.” If they knew, they’d be doing it. Prepare for multiple conversations. Tough issues aren’t resolved with one conversation. Narrow focus. How many problems do you plan to bring up? The answer is one. Sleep on it. Tired leaders lose perspective. How might we move toward partnership? How will new behaviors be designed? Pierce the veil of disappointing behaviors and poor performance by practicing courageous transparency, kind candor, and forward-facing curiosity. How might leaders prepare for tough conversations? Leaders need to know the strengths and weaknesses of whom they are conversing with. Be prepared to “accentuate the positives” yet don’t “pound on the negatives”. Paint a clear picture of their expected journey on the path they chose and why they chose it. Allow the conversation to be a joint effort if possible. Thanks Tim. I appreciate your insights. The little phrase, “why they chose it,” speaks volumes. Let’s include discussions about inner motivators and purpose. Ah, this came a couple of days too late! “Tough issues aren’t resolved with one conversation.” So true, and so often overlooked. “The choice to avoid difficult conversations often masquerades as kindness” and is usually a sign of incompetence. Good leaders make tough decisions and address difficulties head in. Thanks, Dan. Dan – you provoke some thinking about getting people to agree – thanks. Understanding what motivates people – and their individual hot buttons – seems important in gaining agreement. If we understand these – we may secure willing contribution to more than 1 narrow objective. Aim high! Great post Dan! Thank you! I have been following you for years now and it was a result of a crutial conversation that went completely sideways. I am proud to say I practiced these methods, unfortunately sometimes some people are not as willing to participate! That’s out of our control. Great post Dan! Love reading every article you write over the years…often very thought provoking and really gets me thinking and reflecting. To the point of this article I think if the individual (Ieader) who has to initiate the conversation, has an understanding of what motivates that individual and for what purpose / what their hidden agenda, often times it makes it easier to have that dialogue. Planning the expectations of the outcome you are trying to reach may direct the conversation as well. It may or may not get to that actual outcome but at least it’s a path you can take for the discussion.